Before the development of the Haber process, ammonia had been difficult to produce on an industrial scale, with early methods such as the Birkeland–Eyde process and Frank–Caro process all being highly inefficient. 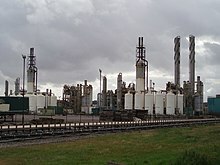 Although the Haber process is mainly used to produce fertilizer today, during World War I it provided Germany with a source of ammonia for the production of explosives, compensating for the Allied Powers' trade blockade on Chilean saltpeter. Throughout the 19th century the demand for nitrates and ammonia for use as fertilizers and industrial feedstocks had been steadily increasing. The main source was mining niter deposits. At the beginning of the 20th century it was being predicted that these reserves could not satisfy future demands  and research into new potential sources of ammonia became more important. The obvious source was atmospheric nitrogen (N2), comprising nearly 80% of the air, however N2 is exceptionally stable and will not readily react with other chemicals. Converting N2 into ammonia posed a challenge for chemists globally. Haber, with his assistant Robert Le Rossignol, developed the high-pressure devices and catalysts needed to demonstrate the Haber process at laboratory scale. They demonstrated their process in the summer of 1909 by producing ammonia from air, drop by drop, at the rate of about 125 ml (4 US fl oz) per hour. The process was purchased by the German chemical company BASF, which assigned Carl Bosch the task of scaling up Haber's tabletop machine to industrial-level production. He succeeded in 1910. Haber and Bosch were later awarded Nobel prizes, in 1918 and 1931 respectively, for their work in overcoming the chemical and engineering problems of large-scale, continuous-flow, high-pressure technology. Ammonia was first manufactured using the Haber process on an industrial scale in 1913 in BASF's Oppau plant in Germany, reaching 20 tonnes per day the following year. During World War I, the production of munitions required large amounts of nitrate. The Allies had access to large sodium nitrate deposits in Chile (Chile saltpetre) controlled by British companies. Germany had no such resources, so the Haber process proved essential to the German war effort. Synthetic ammonia from the Haber process was used for the production of nitric acid, a precursor to the nitrates used in explosives. 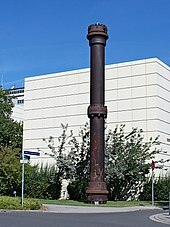 A historical (1921) high-pressure steel reactor for production of ammonia via the Haber process is displayed at the Karlsruhe Institute of Technology, Germany. This conversion is typically conducted at 15–25 MPa (150–250 atm; 2,200–3,600 psi) and between 400–500 °C (752–932 °F), as the gases (nitrogen and hydrogen) are passed over four beds of catalyst, with cooling between each pass so as to maintain a reasonable equilibrium constant. On each pass only about 15% conversion occurs, but any unreacted gases are recycled, and eventually an overall conversion of 97% is achieved. The steam reforming, shift conversion, carbon dioxide removal, and methanation steps each operate at pressures of about 2.5–3.5 MPa (25–35 bar; 360–510 psi), and the ammonia synthesis loop operates at pressures ranging from 6–18 MPa (60–180 bar; 870–2,610 psi), depending upon which proprietary process is used. The major source of hydrogen is methane from natural gas. The conversion, steam reforming, is conducted with steam in a high temperature and pressure tube inside a reformer with a nickel catalyst, separating the carbon and hydrogen atoms in the natural gas. Nitrogen (N2) is very unreactive because the molecules are held together by strong triple bonds. The Haber process relies on catalysts that accelerate the scission of this triple bond. Above this temperature, the equilibrium quickly becomes quite unfavorable at atmospheric pressure, according to the van 't Hoff equation. Thus one might suppose that a low temperature is to be used and some other means to increase rate. However, the catalyst itself requires a temperature of at least 400 °C to be efficient. is standard pressure, typically 1 bar (0.10 MPa). Economically, pressurization of the reactor is expensive: pipes, valves, and reaction vessels need to be strengthened, and there are safety considerations when working at 20 MPa. In addition, running compressors takes considerable energy, as work must be done on the (very compressible) gas. Thus, the compromise used gives a single pass yield of around 15%. Another way to increase the yield of the reaction would be to remove the product (i.e., ammonia gas) from the system. In practice, gaseous ammonia is not removed from the reactor itself, since the temperature is too high; it is removed from the equilibrium mixture of gases leaving the reaction vessel. The hot gases are cooled enough, whilst maintaining a high pressure, for the ammonia to condense and be removed as liquid. Unreacted hydrogen and nitrogen gases are then returned to the reaction vessel to undergo further reaction. The most popular catalysts are based on iron promoted with K2O, CaO, SiO2, and Al2O3. The original Haber–Bosch reaction chambers used osmium as the catalyst, but it was available in extremely small quantities. Haber noted uranium was almost as effective and easier to obtain than osmium. Under Bosch's direction in 1909, the BASF researcher Alwin Mittasch discovered a much less expensive iron-based catalyst, which is still used today. Some ammonia production utilizes ruthenium-based catalysts (the KAAP process). Ruthenium forms more active catalysts that allows milder operating pressures. Such catalysts are prepared by decomposition of triruthenium dodecacarbonyl on graphite. In industrial practice, the iron catalyst is obtained from finely ground iron powder, which is usually obtained by reduction of high purity magnetite (Fe3O4). The pulverized iron metal is burnt (oxidized) to give magnetite of a defined particle size. The magnetite particles are then partially reduced, removing some of the oxygen in the process. The resulting catalyst particles consist of a core of magnetite, encased in a shell of wüstite (FeO, ferrous oxide), which in turn is surrounded by an outer shell of iron metal. The catalyst maintains most of its bulk volume during the reduction, resulting in a highly porous high surface area material, which enhances its effectiveness as a catalyst. Other minor components of the catalyst include calcium and aluminium oxides, which support the iron catalyst and help it maintain its surface area. These oxides of Ca, Al, K, and Si are unreactive to reduction by the hydrogen. Reaction 5 occurs in three steps, forming NH, NH2, and then NH3. Experimental evidence points to reaction 2 as being the slow, rate-determining step. This is not unexpected since the bond broken, the nitrogen triple bond, is the strongest of the bonds that must be broken. Due to its dramatic impact on the human ability to grow food, the Haber process served as the "detonator of the population explosion", enabling the global population to increase from 1.6 billion in 1900 to 7.7 billion by November 2018. Nearly 50% of the nitrogen found in human tissues originated from the Haber-Bosch process. Since nitrogen use efficiency is typically less than 50%, farm runoff from heavy use of fixed industrial nitrogen disrupts biological habitats. The Haber-Bosch process is one of the largest contributors to a buildup of Reactive nitrogen in the biosphere, causing an anthropogenic disruption to the Nitrogen cycle. ^ Papers, Chemistry (2018). Habers process chemistry. India: Arihant publications. p. 264. ISBN 9789313163039. ^ Appl, M. (1982). "The Haber–Bosch Process and the Development of Chemical Engineering". A Century of Chemical Engineering. New York: Plenum Press. pp. 29–54. ISBN 978-0-306-40895-3. ^ a b c Smil, Vaclav (2004). 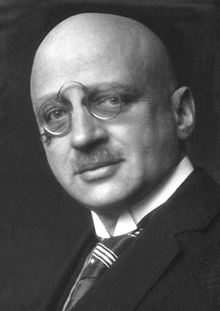 Enriching the Earth: Fritz Haber, Carl Bosch, and the Transformation of World Food Production (1st ed.). Cambridge, MA: MIT. ISBN 9780262693134. ^ a b c d e Hager, Thomas (2008). The Alchemy of Air: A Jewish genius, a doomed tycoon, and the scientific discovery that fed the world but fueled the rise of Hitler (1st ed.). New York, NY: Harmony Books. ISBN 978-0-307-35178-4. ^ Sittig, Marshall (1979). Fertilizer Industry: Processes, Pollution Control, and Energy Conservation. Park Ridge, NJ: Noyes Data Corp. ISBN 978-0-8155-0734-5. ^ James, Laylin K. (1993). Nobel Laureates in Chemistry 1901–1992 (3rd ed.). Washington, DC: American Chemical Society. p. 118. ISBN 978-0-8412-2690-6. ^ Haber, Fritz (1905). Thermodynamik technischer Gasreaktionen (in German) (1st ed.). Paderborn: Salzwasser Verlag. ISBN 9783864448423. ^ Philip, Phylis Morrison (2001) "From Fertile Minds" (review). American Scientist. ^ "Nobel Award to Haber" (PDF). The New York Times. 3 February 1920. Retrieved 11 October 2010. ^ Brown, Theodore L.; LeMay, H. Eugene, Jr; Bursten, Bruce E (2006). "Table 15.2". Chemistry: The Central Science (10th ed.). Upper Saddle River, NJ: Pearson. ISBN 978-0-13-109686-8. ^ Wennerström, Håkan; Lidin, Sven. "Scientific Background on the Nobel Prize in Chemistry 2007 Chemical Processes on Solid Surfaces" (PDF). NobelPrize.org. Swedish Academy of Sciences. Retrieved 17 September 2015. ^ Bozso, F.; Ertl, G.; Grunze, M.; Weiss, M. (1977). "Interaction of nitrogen with iron surfaces: I. Fe(100) and Fe(111)". J. Catal. 49 (1): 18–41. doi:10.1016/0021-9517(77)90237-8. . Imbihl, R.; Behm, R. J.; Ertl, G.; Moritz, W. (1982). "The structure of atomic nitrogen adsorbed on Fe(100)" (PDF). Surf. Sci. 123 (1): 129–140. Bibcode:1982SurSc.123..129I. doi:10.1016/0039-6028(82)90135-2. . Ertl, G.; Lee, S. B.; Weiss, M. (1982). "Kinetics of nitrogen adsorption on Fe(111)". Surf. Sci. 114 (2–3): 515–526. Bibcode:1982SurSc.114..515E. doi:10.1016/0039-6028(82)90702-6. . Ertl, G. (1983). "Primary steps in catalytic synthesis of ammonia". J. Vac. Sci. Tech. A. 1 (2): 1247–1253. doi:10.1116/1.572299. ^ "International Energy Outlook 2007". U.S. Energy Information Administration. ^ Fertilizer statistics. "Raw material reserves". International Fertilizer Industry Association. Archived from the original on 24 April 2008. ^ Smith, Barry E. (September 2002). "Structure. Nitrogenase reveals its inner secrets". Science. 297 (5587): 1654–5. doi:10.1126/science.1076659. PMID 12215632. ^ Smil, Vaclav (2011). "Nitrogen cycle and world food production" (PDF). World Agriculture. 2: 9–13. ^ Smil, Vaclav (1999). "Detonator of the population explosion" (PDF). Nature. 400 (6743): 415. Bibcode:1999Natur.400..415S. doi:10.1038/22672. ^ Erisman, Jan Willem; Sutton, Mark A.; Galloway, James; Klimont, Zbigniew; Winiwarter, Wilfried (28 September 2008). "How a century of ammonia synthesis changed the world". Nature Geoscience. 1 (10): 636–639. Bibcode:2008NatGe...1..636E. doi:10.1038/ngeo325. ^ Oenema, O.; Witzke, H.P. ; Klimont, Z.; Lesschen, J.P.; Velthof, G.L. (2009). "Integrated assessment of promising measures to decrease nitrogen losses in agriculture in EU-27". Agriculture, Ecosystems and Environment. 133 (3–4): 280–288. doi:10.1016/j.agee.2009.04.025.